While people can get 4K ultra HD videos from camcorder recording, YouTube downloading, Amazon Prime subscription etc, the demand on playing these high definition footage is on the rise. The good news is the Apple Insider has expressed that a New iMac with 4K display hinted in the latest El Capitan beta. That's to say playing 4K videos on Mac El Capitan (10.11.4) will be a reality. Nevertheless, how about the old Macs with bad configuration? Will there be any problem during 4K UHD playback on these older Macbooks or iMacs? Just follow the gudie below. The i7 processor and 5K retina display of iMac Retina 5K display allow users to play 4K UHD videos on Mac OS X El Capitan (10.11.4 incl.) or other Mac OS. But other Macs are out of luck. If 4k video is played on these older Macs, the actual frame rate is lower than the original one s with the excessive CPU and memory consumption, which stumbled 4K video playing on Mac El Capitan or got the player to crash. Professional 4K video player will help, but here a more flexible way is offered for a smoother 4K playback on Mac El Capitan: best 4K video converter. 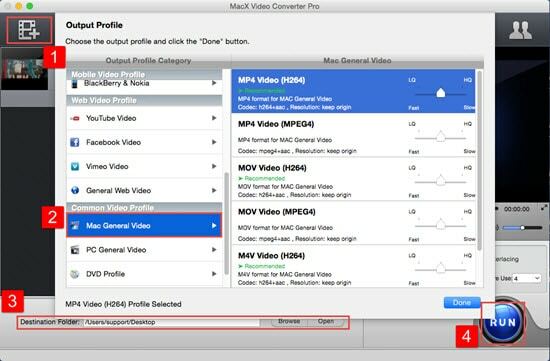 MacX Video Converter Pro for instance, can convert 4K UHD videos to 1080P, 720P in MP4, MOV, M4V formats for a smaller video size with the most appropriate resolution. 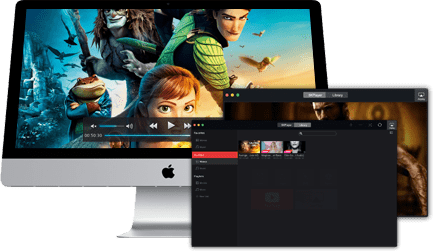 MacX Video Converter Pro allows users to convert 4K videos to lower resolution 1080P to 720P and transcode these 4K UHD videos to Mac compatible formats like MP4, MOV, M4V, MPEG4, H264 etc., with fastest speed due to its hardware acceleration tech. In other word, you can feely play 4K UHD videos on Mac OS X El Capitan without eating up too much of your CPU sources and get better viewing experience on your old Macs. Step 1: Free download the best 4K video converter and run it on your OS X El Capitan Mac. If you have trouble playing 4K videos on PC, go to the Windows version. Then click "Add Files" to load the 4K video to be played on Mac El Capitan. Step 2: Choose the output formats. Click "Mac General Video" to choose the Mac compatible 4K video formats like MP4, M4V,MOV etc. Step 4: Having all these done, hit "RUN" button to start the short journey of converting 4K UHD to Mac. Afterwards, you can eventually play 4K video on macOS 10.12 Sierra. Besides, if the 4K video format is originally supported by Mac and you do not want to change the format, you can simply downscale the video resolution of 4096×2160 by compressing 4K UHD to 1080P or 720P. Just take the same steps to import the 4K video without changing the video format, and click gear setting button to compress 4K resolution to 1080P, 720P etc. After that, hit "RUN" button to convert and save the 4K video in a smaller size and resolution for playing 4K on Mac El Capitan. Finally, you will get the 4K video resized and compressed for a perfect viewing on your general Mac PC. 4k videos not playing on Mac El Capitan? Another option for you: try a professional 4k video player for Mac El Capitan. There are various video players that claim to play 4K videos smoothly, including Media Player Classic, DivX Player, VLC Player. But if the best El Capitan 4K video player is to be selected, 5KPlayer is recommended for you. 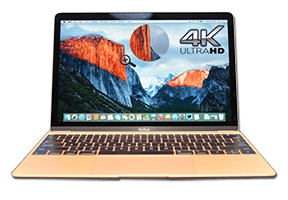 It can smoothly play 4k UHD videos on Mac OS X El Capitan, Windows 10, as well as HD 1080P, 720P, 360 virtual reality smoothly in excellent quality in whatever formats. It's totally free and safe. 5KPlayer - 100% free 4K video player to play any 4K video on Mac El Capitan/Yosemite as well as Windows (10). Also free stream 4K video from Mac/PC to Apple TV and airplay video from iPhone iPad iPod to Mac (El Capitan) and Windows (10) smoothly & clearly! 4K UHD, a resolution of 4096×2160, enables users to keep an close eye to every video details with bright color, clear sharp words and super real audio effect. The next question is where to get these amazing 4K videos? Here shares you the main methods to obtain 4K videos for later playback on Mac El Capitan. Netflix. For $12 a month, you can watch all of Netflix’s 4K movies and TV shows, streaming over the Internet, right now. But you need a very fast Internet connection to accommodate playing and streaming 4K. Amazon. If you’re an Amazon Prime member ($100 a year), you can stream 4K shows at no extra charge. At the moment, there are 33 movies available, plus Amazon's original TV series. Again, a fast Internet connection is required (15 Mb/second or better). Sony-FMP-X10. This is a $700 set-top box containing a hard drive and access to Sony's Unlimited 4K service, which is actually very limited because of only 75 movies and 125 TV episodes and free clips are available. YouTube. Already, YouTube offers more than 4 million video clips in 4K which allows to free download for playing 4K videos on Mac El Capitan. By the way, an increasing YouTube similar video sharing sites like Vimeo, VeVo Dailymotion also offered 4K video for watching. DVD, Blu-ray. Nothing yet 4K video requires too much data to fit a standard movie on a Blu-ray disc, let alone a DVD. As 4K videos are not widespread and most are paid, you can only pick 4K videos from limited sources. So free download 4K video to Mac El Capitan from YouTube is a reasonable way to gain 4K videos for El Capitan 4K video players. 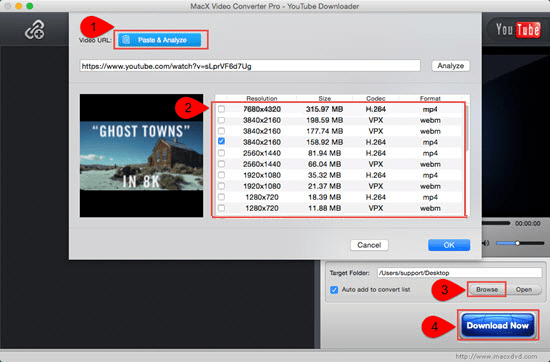 MacX Video Converter Pro precisely can be treated as a Mac YouTube downloader to free download 4K content video to Mac El Capitan in a fast speed and high video audio quality from 300+ online sites like YouTube, FaceBook, Vevo, Vimeo etc. Only 4K video URL is needed to detect the video details for fast video downloading from YouTube for playing 4K on Mac El Capitan.